My move is done and it is time to return to having fun with Frisian! As mentioned in the previous post, I'd like to take a quicker look at the second and third verses of De Wâldsang. Remember, you can read the full lyrics here. Please bear with these next few entries: I'm just going to give cut-and-dry vocabulary words with their approximate pronunciations. I'll be returning to more regular lessons after these posts. As usual, any errors are my own; feel free to comment if you would like to share a correction. Moanne - "month, moon." MOH-ah-nuh. Pronkje - "make a show, parade" PROHn-kyuh. The word in the song, pronkseal, possibly combines the work pronk (the noun "show") with the word eal, meaning "noble." IH-uhl. It (short-form 't) - "the, it." UHt. Hôf - "garden, court." HAWF (rhymes with the English "off"). Yn't - short for yn it, "in the." EENT. Finlân - "fen lands." FIHN-LAHN. Rinne - "they walk, go." RIHN-nuh. The grain waves over the field, gentle is its magnificence. Weag't - "he, she, it waves." VIH-uhg. It - "the, it." UHt. Swiid (swiet)- "gentle, soft, sweet." SWEE-uht. Pracht - "magnificence." 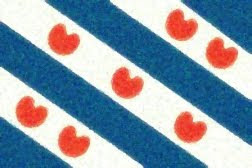 PRAHkht (see the note on the Frisian -ch- above). Part II in this series is available here. Part IV, the third and final verse, is available here.